We offer a wide array of auxiliary products: holding tanks and high rise kits for multi-story job sites are just a few of items offered to make your job easier. Our list of accessories reads like an a-la-cart menu. Pick and choose exactly the features you’d like to outfit the perfect configuration for your needs. Just ask the question. We’ll provide the answer. Servicing multi-story job sites are a breeze with our High Rise Kit. Simply attach the steel sling to the skid of your standard-sized unit, and a crane will be able to lift the unit into location on an upper floor. High Rise Kits are available for use with any of our skid options (wood, plastic lumber, plastic molded). Each leg of the sling is manufactured using painted tubular steel, hammered flat at the points it is bolted on to the unit. 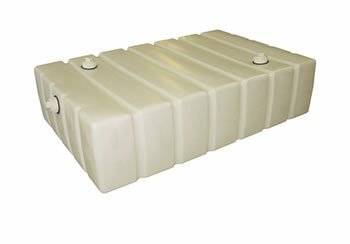 Our 250-gallon rotationally molded polyethylene holding tank works well in many applications. It is most often used under on-site office trailers, but has also been used for temporary waste storage in other locations as well. The low profile tank has dimensions of 6′ x 3′ 11 ½” x 18″. Four 3″ clean out ports are typically installed on each tank, but custom tanks with as few as two ports may be produced. A uni-seal grommet and threaded PVC connector are inserted in each port. Each tank weighs 100 lbs. See the photo below, or the CAD artwork for details on the tank design. 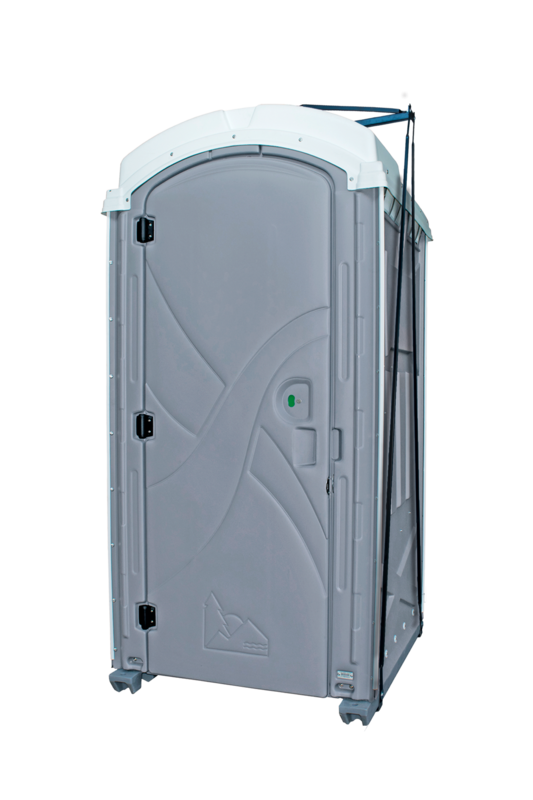 Skid Options: A Flush Away offers a wide array of choices regarding the unit base. The following list outlines the standard skid configurations available, but combinations of these various components may also be provided. Plastic Molded Skid: Heavy duty one-piece rotationally molded base with stake down holes molded into runner tips. Combo Skid: Pressure treated lumber base with •” solid plastic floor and plastic lumber runners. Plastic Lumber Skid: Plastic lumber base with plastic lumber runners and solid plastic floor. Motion Activated Light: Battery operated motion-activated light comes with hinge for mounting that allows access to battery compartment. Coat Hook: May be mounted on the door or any unit wall. Vanity Shelf: Mounts around the vent stack.